Matthias Tharang studied at the Gerrit Rietveld Academie in Amsterdam, and completed his Master in Fine Art at Goldsmiths in London. He currently lives and works between Amsterdam and London. Primarily working in installation and moving image, the core of his work is to challenge patterns of thought by alienating power relations. Examining strategies of persuasion and their impact on the shaping of ideologies, he explores the intersections of contradictory positions. Following from this his work investigates the invisible space between utopia and dystopia – in particular the unstable borders of belief and disbelief, security and instability, or superiority and inferiority. 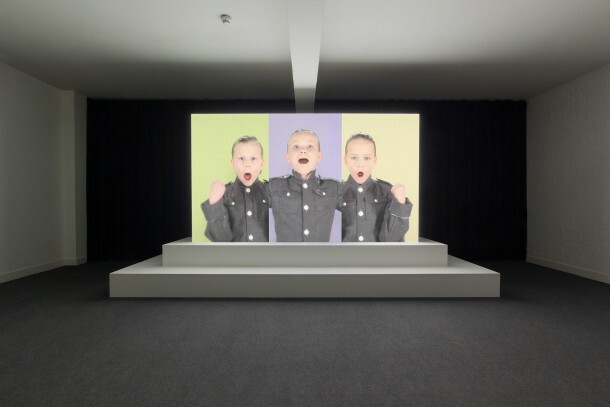 Amongst others, he participated in shows of the Government Art Collection, the ICA, Spike Island, Brakke Grond, Whitechapel Gallery, and Museum Folkwang. Besides he featured in the Catlin Art Guide and took part in the 5th Moscow Biennale for Contemporary Art. During his residency, Tharang will continue his research on the intersections of architectural features, which are influencing collective memory, and commercial aspects of shaping memory. Starting point of his artistic investigation will be the history of the former Eastern Bloc in general, and Hungarian history in particular, with its continuous shifts of political and economic systems. He is specifically interested in the remnants of the physical structures of these systems and their co-existence with the outcomes of commodification.